This Kit Will Enable You To Easily Fix Your Aluminium Sheet / Stainless Steel Sheet / Kitchen Splashback To The Wall. This Will Allow You To Quickly And Easily Fix Your Sheet To The Wall, With No Unsightly Screw Heads Visible. Simply Add One Of These KIts To Your Basket When You Order Your Desired Sheet. Please Ote That We Can Only Offer The Holes Drilled As Described Above – We Do Not Currently Offer A Bespoke Drilling Service. The Drilling Service Is Only Available On Stainless Sheet Up To And Including 1.5mm Thick. This kit will enable you to easily fix your (Stainless Steel Sheet / Kitchen Splashback) OR (Aluminium Sheet) to the wall. We will pre-drill a 5mm dia hole in each corner of your sheet, approx 30mm in from the edges. 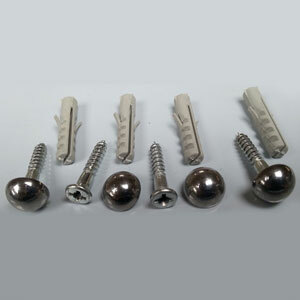 You will then receive fixing pack containing 4 x screws (No.6 x 25mm) with decorative shiny domed covers & 4 x Wall plugs. This will finish your project off nicely, with no unsightly screw heads visible.